Look for and analyze evidence in a case. Check that the evidence presented in the case was collected in accordance with the law. Advise relevant parties, e.g. attorneys, juries, litigants and court personnel regarding conduct, issues and proceedings. Determine a sentence based on all evidence and the law. Organize and follow up the execution of the sentence. The legal procedures and standards that courts follow in civil lawsuits. 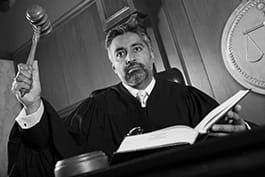 Maintain the order of a court during a hearing to ensure that the hearing can occur without obstructions and intrusions, to ensure that all present follow courtroom procedural policies, and to ensure safety. Supervise the procedures during a court hearing to ensure they are compliant with regulations, occur in an orderly and honest manner, and to ensure that no moral or ethical boundaries are crossed during questioning or the presentation of legal arguments. Hear legal arguments presented during a court hearing or other context in which legal cases are handled and decided upon, in a manner which provides both sides equal opportunity to present their arguments, and making a decision based on the arguments in an honest and impartial manner.